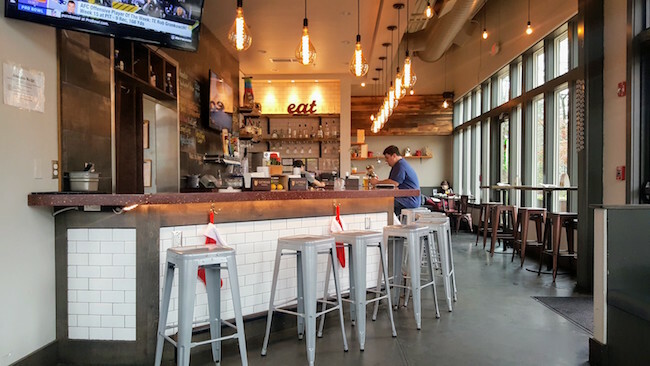 Local Taco in Birmingham Offers up a Fresh Take on a Crowd Favorite! Local Taco has a Fresh Take on a Crowd Favorite! Local Taco has just six locations, but they are about to open a new one at The Colonnade! 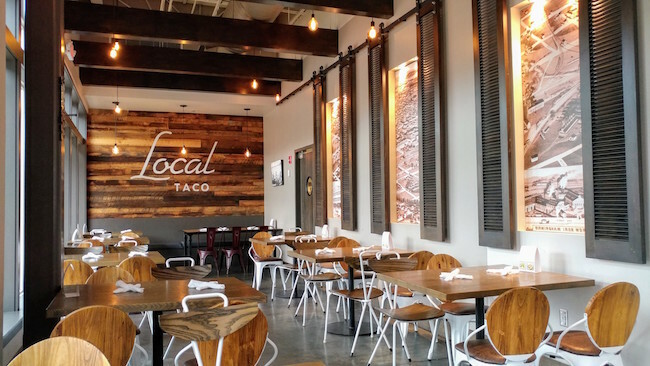 Tucked away in Lane Parke, Local Taco recently made the switch to a fast casual approach to dining. The “L” shaped layout has plenty of seating and features a patio for enjoying tacos and ‘ritas outside in the open air. Amber and I decided to meet up for an early lunch so we could take food photos without getting in the way of too many people. By the end of lunch, I had eaten so much food that I almost completely skipped dinner! The first thing we noticed was that they had a fun drink menu! Of course there are house made margaritas, but they also have frozen sangria drinks as well! 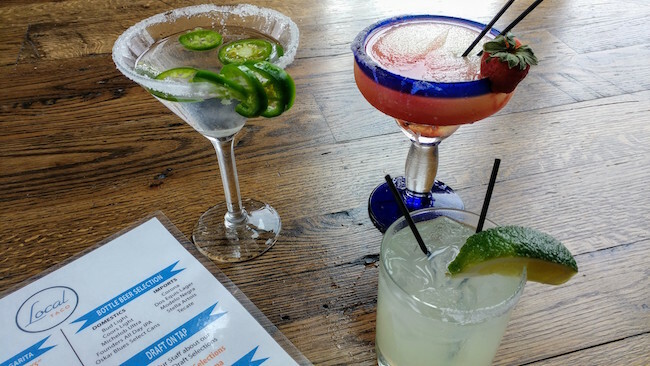 These drinks make for a great time socializing with friends, plus Local Taco features happy hour pricing all day, everyday! 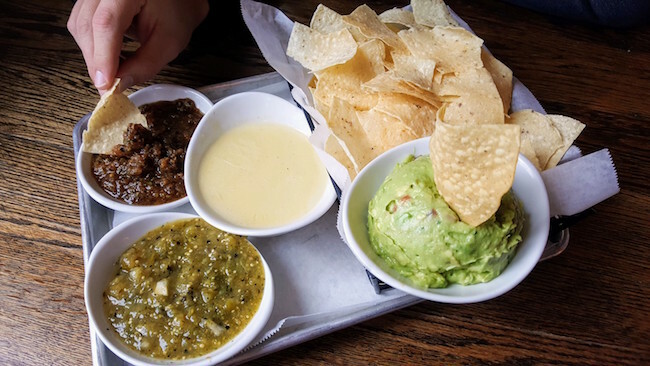 We wanted to try a good selection of appetizers, so we started with The Trio, which features fresh guacamole, queso, and salsa (both verde and rojo)! The salsa was out of this world! After seeing me dive in, Amber jokingly asked if I wanted to use her straw instead of the chips! The guacamole was very flavorful as was the queso. 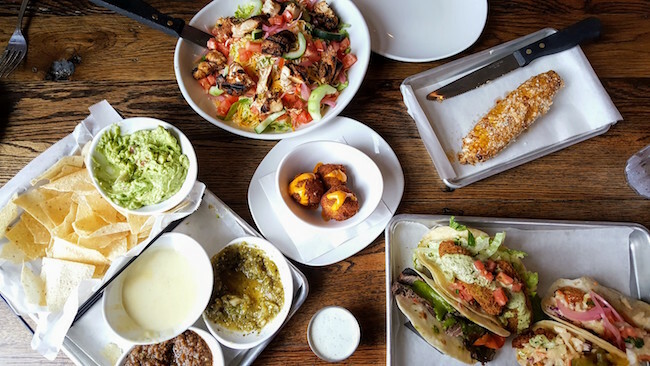 Salsa and Queso can be a weak point for lots of mexican restaurants, but Local Taco uses it as an opportunity to shine even before your meal is served! 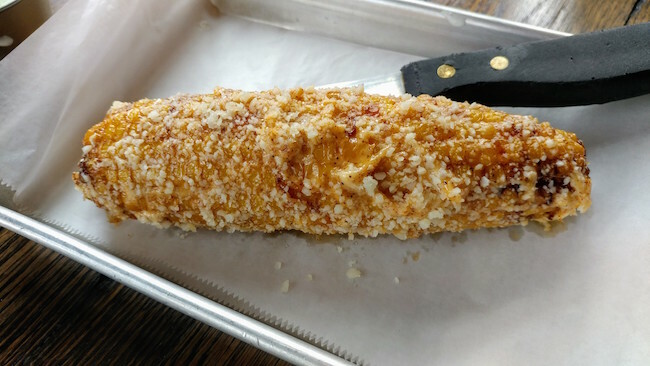 Street Corn is one of our favorite things to eat at hispanic festivals, so we were both very excited to see it listed on the menu! You can get in on the cob or in a bowl. We opted for the whole cob and it did not disappoint. It was roasted and seasoned to perfection before being topped off with Cotija cheese. You may want to ask for extra napkins though. 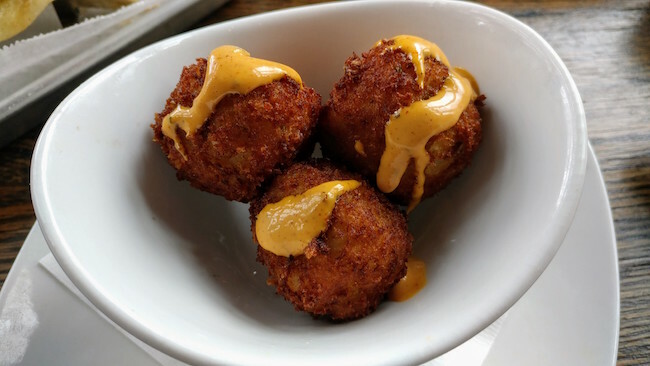 It’s not often that we try something that’s truly new to us, but the Mexi-Tots caught us by surprise! Local Taco somehow (magic?!) managed to ball up, batter, and fry mashed potatoes! These are served warm and drizzled with a spicy sauce. This falls into the “you’ve GOT to order this” category as it’s a finger food that’s both fun and delicious! Remember those Bud Light “Real Men of Genius” ads? Mr. Giant Taco Salad Inventor?? (Watch it here. You’re welcome!) 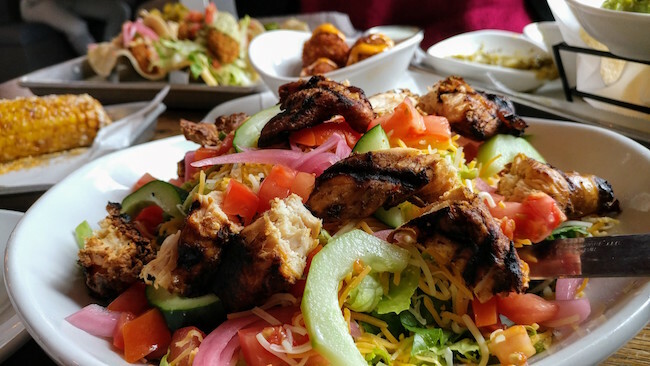 That’s what I normally think of when it comes to mexican food and salads, a 12,000 calorie salad where “..you can eat that deep fried crunchy bowl!” Well, forget all of that. Local Taco’s Concinero salad is both delicious and healthy! It features fresh spring mix, tomato, cucumber, pickled onions, and monterey jack cheese. If you opt to add chicken it is a meal in and of itself! Granted, we ordered a LOT of food, but we had enough salad left for both of us to make lunch with the next day! We have covered some amazing food and are just now getting to the best part of Local Taco. The Tacos!!! A lot of creativity went into the taco menu here. 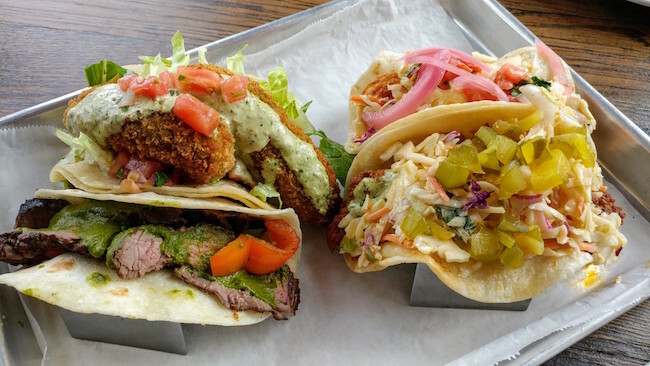 We tried four different tacos, all of which were incredible in their own distinct way. The Nashville Hot Chicken is the best-seller and I can see why! 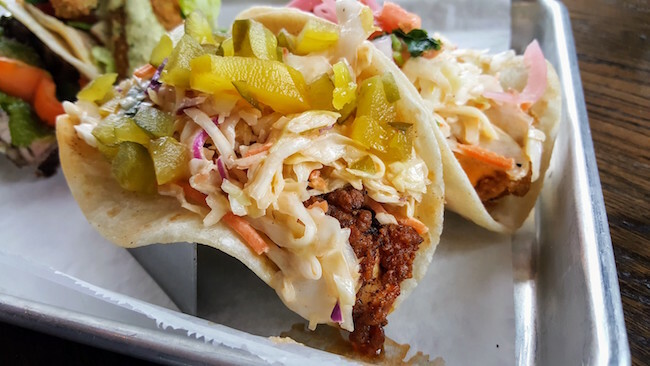 Not only does this taco feature spicy chicken, it is also topped with slaw, pablano cream sauce, and chopped Wickles Pickles! Is that a tear for joy, or sweat from my brow? It’s kinda hard to tell, but either way this taco is incredible! If you want to go vegetarian, you can always opt for the Avocado taco! Topped with black beans, lettuce, pico, and cream sauce this is more of a California style taco. But, let’s take this to the next level, shall we? 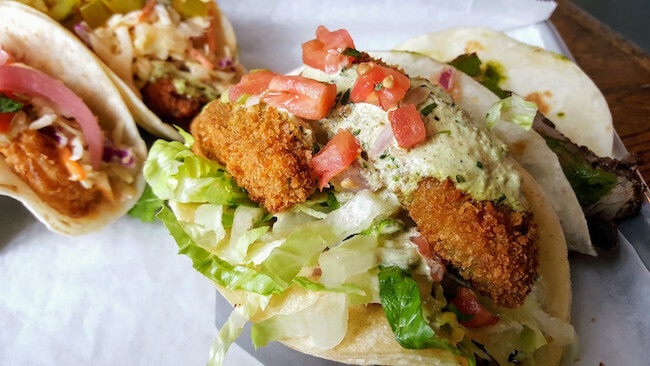 You can order this taco with the avocado FRIED! Y’all...where has fried avocado been all of my life? It’s both crunch AND creamy with all of the avocado flavor I love so much! Do yourself a favor and don’t skip this one! The Spicy Baja Shrimp taco is super fresh! The shrimp were massive and it’s topped with a “boom-boom” sauce that adds a nice kick. 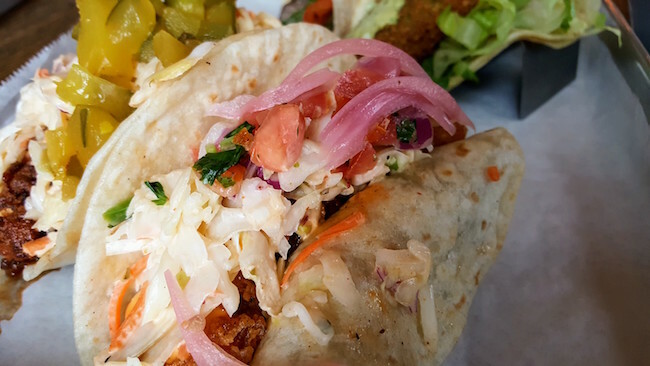 The fresh pico, onion, and slaw help pack a ton of flavor into one taco. This is definitely a great option if you are looking to keep your tacos on the lighter side and still get your fill! We tried the surf, so it was time for the turf! El Carnicero contains a flavorful strip of house marinated skirt steak topped with peppers and onions. 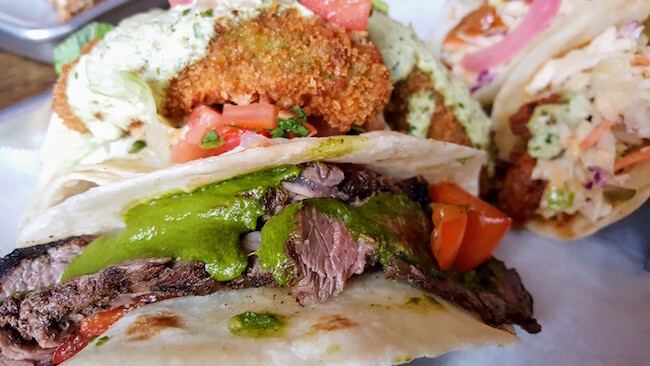 This meaty taco isn’t playing around especially when topped with chimichurri sauce! We may have fought a bit over who got the last bite of this one. Trying so many different items is especially tough when everything is so delicious you want to eat the whole portion right then! Needless to say, we were pretty full, (Ok, I was stuffed) but we had to try dessert. Luckily, the Local Taco Sopapilla was on the lighter side. 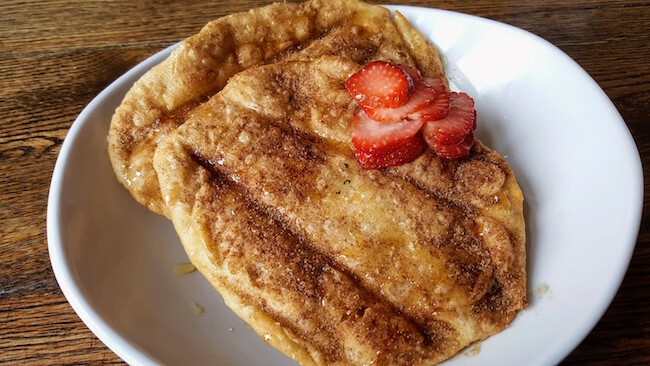 This dish includes two sweet, crunchy, tortillas that have been dusted with cinnamon & sugar before being drizzled with honey! Did we mention that it comes topped with strawberries?! This was the perfect way to end the meal! We had a wonderful lunch at Local Taco and we look forward to going back soon. The staff was extremely accommodating and took time to tell us about each item. I can’t wait until it gets warmer again so we can enjoy the food on the patio. 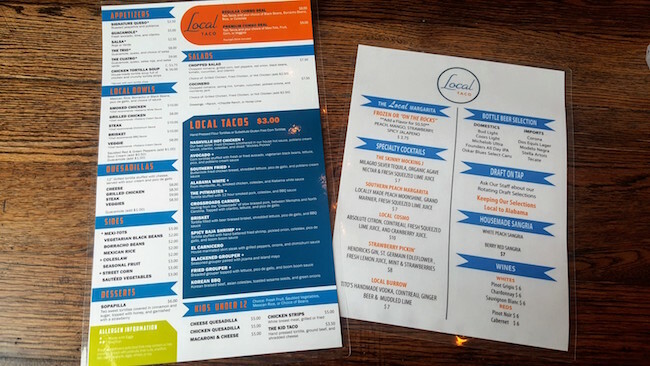 With such a reasonably priced menu and such fresh ingredients, Local Taco is a great option for a quick lunch or a relaxing dinner! Even though we tried as many items as we could, there are still plenty of menu options left for us to explore! 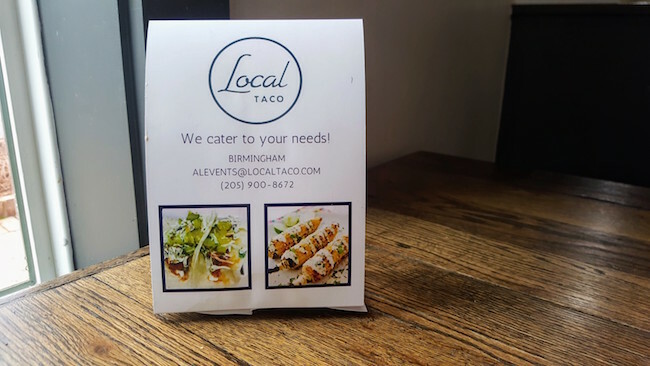 Oh, and Local Taco offers Catering! 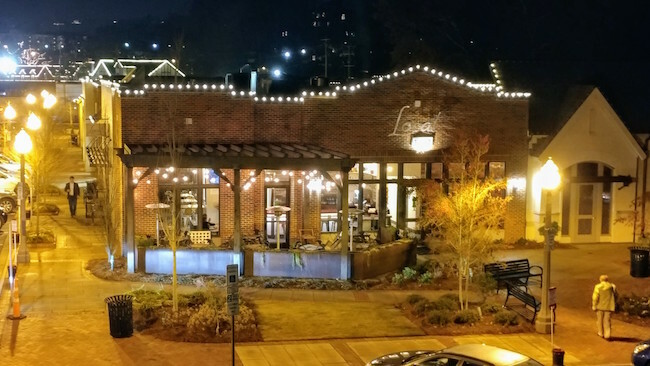 Ring in 2018 Right with these Great Birmingham New Year's Eve Events!